You are here: Home » How to help people find you? You just joined a talk-of-the-town web service and invited a few of your friends to join it too. Some of them responded and invited their friends in turn. Soon you are dodging email invitations left and right. Your friendly neighborhood web service just does not realize that sending out mass invitations to friends is passé. So, how do you allow people who you already know to connect with you without all this invite spam? You want to be found by your friends when they join the service, and you want it to be done automatically. The problem is that names are not unique and no serious web service wants to compromise your online privacy by asking for your social security number. So how do you increase the chances of people finding you on Facebook, Twitter, Flickr or any other new web service? The answer is storing your email addresses in your profile. Email addresses do the trick as they are uniquely attached to a person and are usually saved in address books of your friends. If a web service wants to help you connect with people you already know, it usually asks you to enter an email address you use to communicate with your friends. When your friend joins the service and connects with his address book, the web service downloads the address book and compares these addresses with the addresses of the users of the service, establishing a match. Problem solved. Furthermore, the computer engineers came up with a solution to safely comparing email addresses between two web services (e.g. 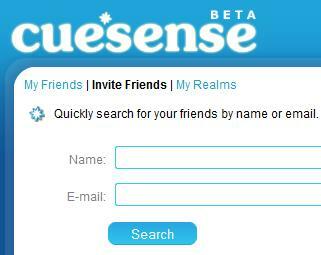 Cuesense and Facebook) without exchanging real email addresses. Instead, these web services essentially encrypt the addresses and compare what is called a “hash”. That’s how Facebook Connect works, and it has worked pretty well since its introduction. So, all of you social sharers and networkers out there, go and add your main email addresses to your Facebook and other profiles. You’ll help the world get rid of the invite spam and find more of your friends in the services you use.